If you're like me (read: old) then you're always on the look out for nostalgic stuff. You know, things that would make you smile and bring back fond memories. Such is the case with Game & Watch. We had a lot of good times back then. 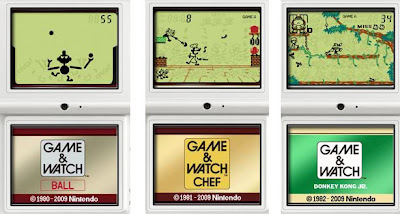 That's why I did a backflip when a bunch of Game & Watch games ended up on DSiWare recently. Pictured below are the classic Ball, Chef, and of course Donkey Kong Jr. Head over here to watch videos.